The culinary couple traveled to Massachusetts to spend Memorial Day with two of our favorite people — and did I mention they’re also fantastic cooks? 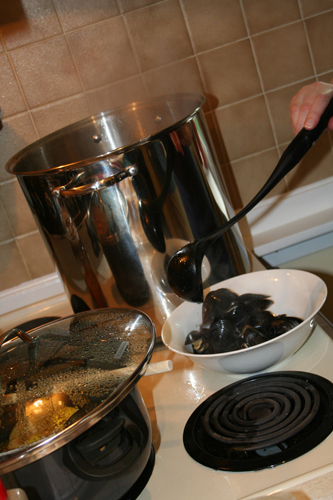 They taught us Pennsylvanians how to clean, steam, and eat fresh mussels. They picked up the recipe at a restaurant in Maryland and added a few touches of their own. The broth was so fragrant and decadent! I don’t think we’ll be able to eat mussels any other way. 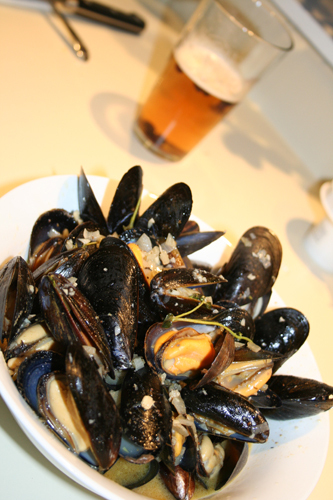 Clean the mussels by rinsing the shells and removing the “beards.” Also it’s very important that the shells are completely closed, otherwise the little guys are already dead … and inedible. Serve with more broth on top! 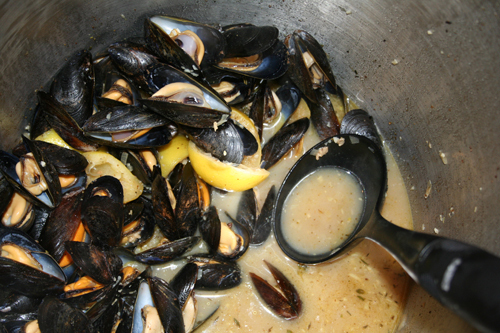 The mussels are even yummier when pulled out of their shells and soaked in the broth. The broth was also perfect for dipping bread! Thanks, Kristen and Eric, for treating us to a wonderful weekend! Read more about our weekend.